The Walking Dead is back but, unfortunately, your regular recapper is not. Rob Bricken wasn’t able to recap this week so I’m filling in as the staff member who quit The Walking Dead most recently. That being, about two seasons ago. So my apologies up front if I miss some nuance or characters that have been introduced since the war between the heroes and Saviors was raging because, frankly, that’s when I gave up. The recaps must continue, though, and Rob will be back soon. But, in the meantime, I did my research, read some of those recaps (like these fine pieces) and popped on the new episode with an open mind. My first thought? Colour me impressed. After giving up on The Walking Dead two seasons ago, to come back and find the beginnings of a new villain and some major characters at even bigger crossroads was a hell of a warm welcome. 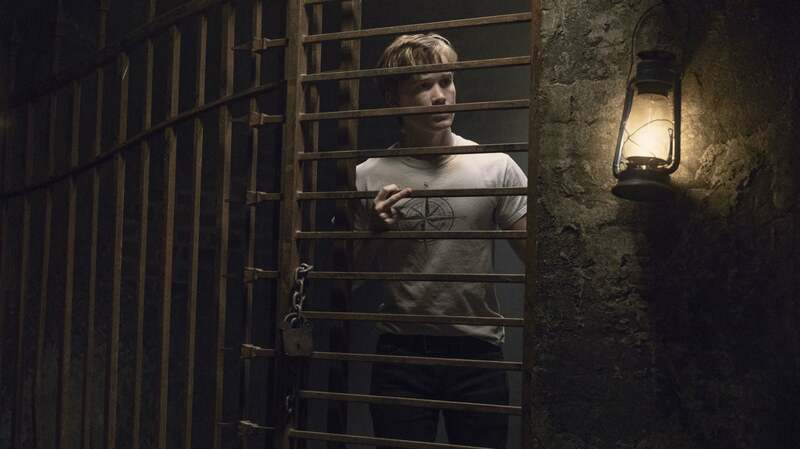 The mid-season premiere, “Adaptation,” picks up right where the mid-season finale left off. Immediately the questions of how Michonne, Darryl and the rest would escape the cemetery, and where the hell Negan went, were dealt with. The answers being, very easily, and not far at all. Even so, the eerie, fog covered cemetery remains a scary sight, but not as scary as a zombie that knows how to open a lock. Of course, this is one of the Whisperers, a new group of villains who wear zombie skins to blend in and are generally awesome. The discovery of their existence drives the main characters in the episode. After the events in the cemetery these characters know, if they see zombies, they can’t just assume they’re all going to act the same way. So Darryl shooting them in the leg to see if anyone screams was a genius way to pick out a Whisperer, and then the two zombies that slowly turn around revealed themselves as well. 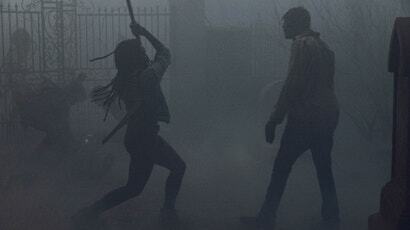 Michonne made quick work of one and the other was taken as a hostage to finally get some answers. Which, at least at the start, didn’t go too well. The group brought the young Whisperer back to Alexandria where the fact Jesus is dead was taken hard. They want vengeance, and this young girl is the lone person to put that on. This puts Tara, Michonne, and Darryl in a bad situation because they need answers about these creepy skin wearers, but also to keep the town at bay. A few tense scenes later and the girl finally gives up a tiny bit of additional information, but not enough. Not yet. So she’s spared, only to reveal to Henry (who is still in jail for getting drunk) that her name is Lydia. Is getting information out of Lydia Henry’s “place” in all of this? Or will he make the dumb teenage decision and side with her? I’m guessing the latter. But at least now we know her name, that there are more Whisperers, and one of them is her mother. The fact we know the Whisperers are out there just makes things more intense. Now, anytime the audience sees zombies, it’s not a guaranteed win for the heroes. Case in point, Negan’s story. After somehow talking Judith into letting him escape, Negan is out on his own, where he wants to be. He claims to be a changed man, but that doesn’t stop him from finding a new leather coat and going back to the Saviour hideout, where he oh-so-conveniently had a motorcycle hidden behind a wall. Maybe it’s because I’ve been away from the show for a while but I still haven’t forgiven Negan for all he’s done. So to see him out and about, with seemingly no one looking for him at all, felt really odd. Sure it’s been like five or six years but the dude just up and escaped and no one cares? Has he really been reformed? The episode played with that a lot, as Negan tries his best to only kill when it’s absolutely necessary. Then, there’s the added layer that we know some of the zombies he encounters could be Whisperers, which adds a whole new dynamic. What happens if a charismatic dude like Negan finds these evil people? It’s teased but never happens, and that led to the episode’s weirdest moment. The show sets up that Negan is seeing things. Like the river he drinks out of that’s actually sand. So, we assume when he’s riding his hidden motorcycle back to Alexandria to give himself up, the fact that he sees young Judith with Rick’s gun, hat, and Michonne’s sword is a vision. I mean, it better be. Otherwise, how the hell did she get out on her own? She’s a child. Either way, Negan talks to Judith/his vision of her and agrees with what she said earlier in the episode, “There’s nothing out there for you.” Negan says his cosy cell is better than the outside world and he’s ready to go back. Is he’s being honest? Again, we’ll have to wait and see. 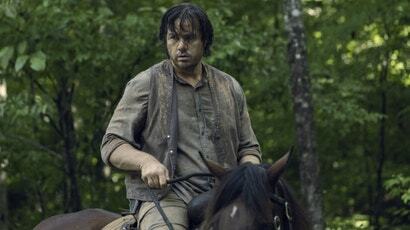 Circling back a bit, early in the episode relative Walking Dead newcomer Luke offers his services to help Alden and the Hilltoppers look for Michonne, Darryl, Jesus, and the others. Of course, they come back relatively soon after but Alden and Luke don’t know that and continue the search. They talk about music, singing, and are eventually baited into a trap. A trap of zombies who wait. Who flank you. Who brandish sawed-off shotguns and say “Trail ends here.” The episode ends with Alden and Luke officially becoming the second group of Walking Dead characters to know about the Whisperers. They won‘t be the last. Look, I hated The Walking Dead when it was humans fighting humans for what felt like forever and the zombies were an afterthought. But jumping back in for this episode, I remembered what this show could be. Scary, surprising, exciting, all that potential was there in “Adaptation”. Hell, I may even tune in again next week whether Rob is back or not. I wish Negan would have stuck to either the shovel or the pipe. He’s cool when he just has one signature weapon. Maybe I missed it but when Michonne thanks Darryl for looking for “Him” (I assume Rick), and also for what he did “After”, was that a tease or just a piece of the puzzle I’m missing? Rosita is pregnant! And it’s Siddiq’s! Aww. Keep the population growing, y’all. The best part of the reveal, though, was that Rosita’s morning sickness was hinted at maybe just being a reaction of Eugene about to profess his love for her. We’d puke too. There were lots of characters missing this week. Mostly the Alexandria crew. Which, now that I think of it, is probably why we didn’t hear or see anything about people going after Negan.